Much as I try to live in the present, I find myself often looking to the future or the past, searching for clues of what's to come, or reasons for things that have happened. When I look to my future, I'm excited, full of expectations and goals. When I look to my past I'm introspective, regretful, or wistful, depending on which segment of my past I'm calling up in my mind. The first 13 years of my childhood really were glorious. I grew up adventuring, hiking, swimming, and exploring on the hills above the Lewis Clark Valley where my parents built their dream home shortly after I was born in July of 1987. My 3 older brothers and I spent the long, hot, banana belt summers using our imaginations to their full extents, perfectly tucked away in our corner of paradise; huge, custom-built home, 5 acres of pool, tennis courts, tree houses and manicured lawns, we really couldn't have asked for anything better. Warm memories exist of my mother tending to her vast flower gardens, cooking meals, homeschooling us, and pouring herself out for myself and my siblings. My dad worked diligently on his latest entrepreneurial endeavor and in his spare time read to us, took us on bike rides and hikes, and instilled in us a solid work ethic. Nothing can tarnish those years, they are on a plane all their own. As we got older my parents became more involved in the Reformed church and eventually decided it would be in the best interest of our family to relocate to Moscow. Closer to the church community, closer to friends, further from our life in Lewiston that wasn't particularly abundant in social connections or options for the future...it seemed like the right thing. Our new life in Moscow was so very, very different than what I grew up with. The original plan was to build a home on Moscow Mountain where we'd purchased property and already built a small, 2 story cabin to live in until our larger house plans came to fruition. But they never did. 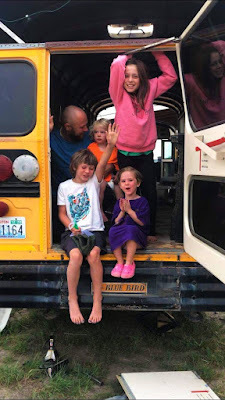 By this time Zach, Rosie, and I were the last 3 kids living at home and even though we were still largely home schooled, Zach and I were being privately or group tutored in several subjects and Moscow was where we spent most of our days. It made sense to be in town. And so my parents bought the 'B Street House', a massive, 7 bedroom, 6,000 sq. foot home built in 1890, full of history, gorgeous architecture, creaks, and green shag carpet. The next several years saw things we would have never predicted. We entertained large groups of people frequently, hosted study sessions for college students, housed countless boarders and guests - all of it exciting and enriching. I taught myself to cook and spent the majority of my weekend hours planning and executing elaborate meals for our many guests. St. Monica's Girls' School, a small, private school, began and was operated for a few years out of our home. Birthday parties, Halloween parties, poker nights, movie nights, and a variety of other social events took place on a nearly constant basis - the B Street house was a social epicenter in our church community and our doors were always open. Unfortunately, in conjunction with the endless frivolity and social buzzing that surrounded our life in Moscow were two things: the beginning of several years of abuse by a boarder in our home and the slow ending of my parent's marriage. Pain came barging into my life like I had never known it before and a dark cloud of depression and imprisonment settled in over me. I kept secrets that should not be kept and slowly cut myself off from my friends, allowing them to know only what I wanted them to. An outcast in my own mind, I lived in constant shame, fearing the disapproval of my abuser and struggling with my infatuation for him. My parents became my enemies, I loathed their opinion and desperately wanted out from under them but also needed them more than ever. Sadly, the abuse continued on in the shadows of that old, cursed house for over 2 years. How no one knew is still a mystery to me. I remember falling asleep with tears almost every night for months on end, wanting nothing more than to be an average 14 year old, stopping myself from calling out to my mommy to make everything alright, the way it used to be. I often wondered if I'd sleep through the night. He oiled the door hinges so no one would hear him sneak into my bedroom, the one adjacent to his own, separated only by a shared bathroom. I never heard him until he was on top of me. On and on it went. I carried my secret with me for over a year after the abuse ended. By this time, some of the effects of the abuse had already begun taking their toll on me, I developed insomnia, stomach ulcers and panic attacks. I had serious behavioral problems, suffered mood swings and constant flashbacks. There were interactions between my parents, myself, and my abuser over the course of the abuse, of course, but to go into the details of those would be dangerous. Too many things went unsaid, and to unintentionally insinuate something would only be hurtful and destructive. There need not be any more regrets on the part of those I love. My parent's divorce isn't my story to tell. It effected me, yes, and the abuse I suffered impacted their marriage in very real ways, I'm sure. It took me a lot of years to stop blaming myself. In retrospect, I can't say our move to Moscow ruined me, but it nearly did. I believe everything happens for a reason, and while I think we can take a potentially life destroying experience and turn it into a reason for strength, it does not diminish the ugliness of it. I am strong, resilient, and finally self respecting, but I will spend the rest of my life wishing I had not been hurt by sexual abuse and encouraging abused girls and women everywhere to please, tell your story so that others might not have to. So glad you realize the abuse and divorce weren't your fault. Predators are master manipulators-he fooled the adults in the home, of course you were fooled too. I'm so sorry it happened, but you grew into an amazing woman. So many victims don't come out the other side very well, if they survive at all. You, my dear niece, are a wonderful wife, mother and all around terrific human being. I love you madly. Thank you for sharing your heart and your experience. You are truly one of the strongest young women I know. I sincerely hope that your openness and willingness to share will help other young women in similar situations. I am so proud of you, Natalie, and I love you very much.